Joy Creek Photo Archive (c) all rights reserved Inula ensifolia has delighted us for years in our borders. We were excited to find a compact form that offers the same cheerful ray-flowers on a shorter, bushier plant. Standing at about eight inches in height, it is suitable for the rock garden or the front of a sunny bed. The stemless leaves are lance-shaped and measure about 3.5 inches long. 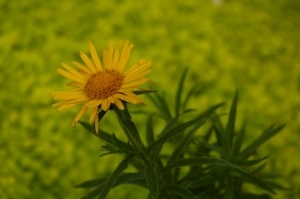 The daisy flowers of Inula ensifolia 'Compacta' measure slilghty under or over an inch in width. Mid- to late summer. 6-8 in. x 12 in.